Since I had 140 spare points for my Deathwing army. 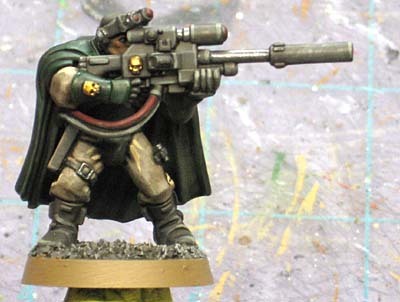 I decided to fill it out with a small Sniper Scout squad. I picked these guys up the other night and spent about a half day getting them built and painted. 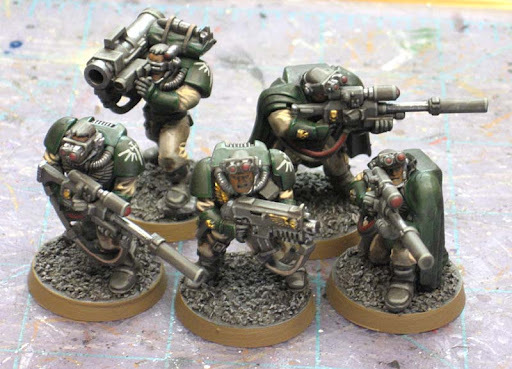 They are done with the same technique as I painted my Deathwing Terminators so they match and everything is consistent. I think these guys turned out much better than my Librarian did. I've got to work on that blue to get it right. One day, I'll strip the paint and redo that model. Just like the Terminators, there's not much to them, just enough to suggest the color and let your mind fill in the rest. That means they paint up real fast. The green is done by starting with the dark grey (like the Terminators) and then making two passes with a Thraka Green wash. 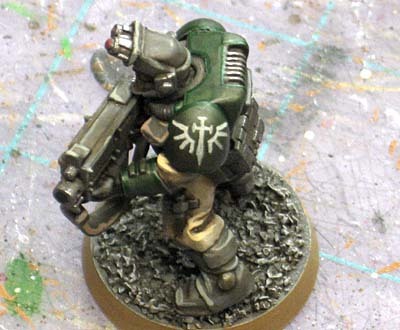 The highlight is done with Dark Angels Green. It's not really a highlight as much as it is an edge of pure color that isn't muted so it stands out slightly. I do make a little extra effort when it comes to things like icons and chapter symbols. I think it helps carry the rest of the model and the extra detail is convincing for me. 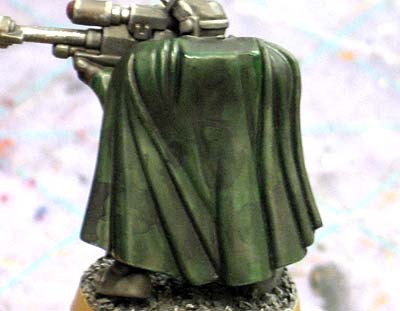 I cheated when it came to painting the camouflage on their cloaks. At first, I was going to leave them just green (yes, I am that lazy), but it didn't look right. I went in with one of my really old and completely destroyed brushes and added the camo by stippling the effect on. It took a couple quick passes, first with Badab Black, then with really thinned black paint and then once again with with moderately thinned black paint. I wanted something subtle but still enough that you might notice it as being camouflaged. In this post here, I go into why I added these guys in particular to my list... besides them filling the points I had left. I love how that camoflage turned out, Ron - nice one! Thank you Sir, it's nothing you IG guys do, but it gets the job done. Had I painted it better, they might have lasted longer in their first game the other night. They look lovely Ron, I particularly like the subtle camouflage on the cloaks. They look the part, and will fit in great with the rest of the army.